Available on Resolume Arena only! When using a Denon mixer with Denon players, you can automatically sync the audio played by the DJ to a video in Resolume. Resolume will keep an eye on what track is loaded in the player. When it sees a linked track, it will sync the video for you. This way, your show will be in sync no matter what. The first thing to make sure is that your players and Resolume are on the same network. On the stage, make sure that you're connected to the "PC" connection on the Denon X1800 mixer. In front of house, make sure your computer running Resolume is in the same IP range and subnet mask as the players. The easiest way to do this, is to use a router that hands out IPs via DHCP and let the router do the rest. When connected, start up Resolume. You will see the available players on the toolbar. Up to 4 players can be connected and synced to at the same time. Resolume will let you know when it can't find any players at all. At this point, you will want to check your network setup and firewall status. Resolume will let you know what ports should be open on the firewall, but maybe it's wisest to just completely open the firewall altogether. You're about to run a fully sync AV set, you shouldn't be using the laptop to browse the web for questionable content anyway. But hey, no judging. Tip! If you don't see any Denon related things at all on the toolbar, make sure Denon StageLinQ is enabled via the View menu. The toolbar will show important and not so important info about the players. Artwork You liek dah perdy picturez? To link a video clip to a track on a player, simply drag the player from the toolbar to the clip. Resolume will now sync the playhead of the video to the audio. It will also trigger the video when the track is loaded in the player. All you need to do is sit back and relax. Resolume will perfectly follow the time of the audio track. You can do whatever you want on the Denon players, and Resolume will follow along. Scratch, loop or slice, everything will stay sync. Once you've assigned a video to be linked to a Denon track, Resolume will make sure that as long as that track is playing on the Denons, it's playing in Resolume as well. This means that you cannot accidentally trigger a different clip into the same layer, or even eject the video from that layer. Essentially, a layer playing a Denon clip is locked until the song is finished, or a different linked video is started in the same layer. Tip! To achieve perfect sync and full audiovisual immersion, of course you need to make sure that your audio and video are the same length. You can't just use throw any audio on top of any video and expect magic to happen. Because you're lining up perfectly synced AV material, Resolume will not stretch your video to the length of the audio. So should your video file end before the audio track is over, Resolume will eject it. To identify tracks, Resolume will use the ID3 title that the track has on the player. On the off chance that the track has no proper ID3 title, it will default to the filename itself. Tip! Don't have the Denon players handy when prepping your set? No problem. You can also set a clip to Denon playback manually. Simply switch the playback mode to Denon and fill out the track name manually. Just like SMPTE playback, Denon playback is only available on clips without an audio track. Once a track is linked, you get access to several options. Here you can limit syncing of a particular clip to a particular player. This way, you can make sure that a certain video clip will only sync when played on Player 1. By keeping the setting to Any, it doesn't matter which player is playing the track. Judge me by my size, do you? For such a small toggle, this holds some very important functionality. This will link or unlink the video layer in Resolume to the fader on the mixer controlling the player that loaded the track. When it's enabled, your video won't be visible until the audio is actually audible. This will work when using the crossfader on the X1800 too. You can of course unlink this to keep the reigns in your own hands. This will let you make adjustments for any offsets between the start point of the audio and the start point of the video. We're only human, so we all make mistakes, especially during deadline crunch time. So if your video accidentally is missing a few frames at the beginning, you can set the offset to make sure it still lines up perfectly. It can be difficult to predict on which player a DJ will play a track. And of course you don't want to double, triple or even quadruple up on each clip to make sure you're ready in the right layer and don't accidentally eject the playing video. This is what the Player Layer Target is for. You set the target by right clicking on the player in the toolbar. 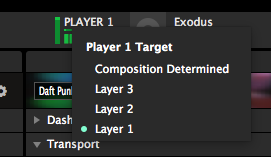 Here you can choose which Resolume layer the video should go, depending on which player is playing the track. So if the DJ starts a track on player 2, while it's target is set to layer 8, the video will play in layer 8. If the DJ had started the track on player 1 while that player's target is layer 7, it would go in layer 7. For this feature to work, you do need to set the Clip Target for all the clips that you want synced. The quickest way to do this, is to select all the clips and change their Clip Target to Denon Player Determined via the right click context menu. Tip! If you are running a fully synced composition, you can also set the Clip Target on the composition level. This way, newly added content will be set correctly on import. Time for another baconator layer, player.